The Omnicryses store psionic teachings and wisdom of the ancient Forerunner race. Most puzzling is the incredibly powerful Broken Omnicrys. It holds the peaceful teachings of one Forerunner faction, combined with the aggressive teachings of the faction that caused their downfall. Now, an insane Nova Templar stole the Broken Omnicrys, and used it to amplify his psionic powers drastically. Escaping in a stolen smuggling ship, he heads for Karmsworld, a hive in the Beta Hydrae system. 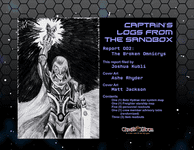 This Captain's Log, designed for use with any science-fiction roleplaying game, contains story ideas and background information on the Broken Omnicrys, the Mad Templar, the stolen smuggler ship Valterion, and an entire star system to explore!